XF3600 is an economical all-digital portable color doppler ultrasound diagnostic system introduced by pioneer in 2016.It is compact in appearance and powerful in function.Built-in specialized measurement software package: department of gynaecology and obstetrics, distance,perimeter,area, heart rate, slope, time, the expected date of childbirth, gestational age and fetal weight and so on the many kinds of practical measurement analysis software, stream lined body design, the host may at any time carry visits, six languages interface, double probe socket, apply to stomach, of department of gynaecology and obstetrics, the urology department, small organs and blood vessels and other parts of the inspection, especially suitable for large hospital bed and clinical examination of the basic medical institutions.Is a high cost - effective instrument. Real-time 2D and Color Dual Mode. Real-time 2D and Doppler Double Synchronization. 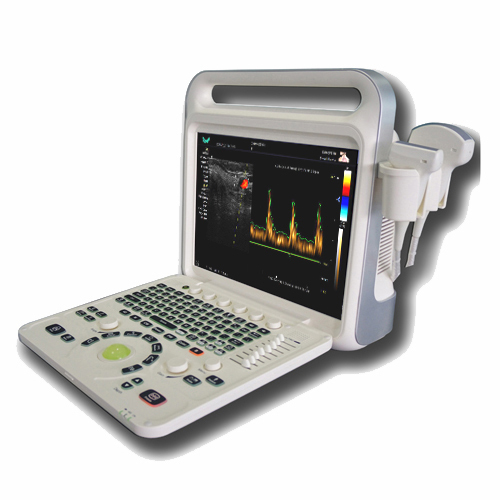 Real-time 2D ,Doppler and Color triple synchronization. Multimedia and peripheral devices:Compact Disc-Recordable,USB portable storage device. Memory Function:Image Storage,Video Storage,Cineloop(≥300 Fram),Solid disk storage space≥120G. Puncture guide line:All kinds of probes can register puncture guide line function. The puncture guide line Angle adjustable and can be pre-defined. Language:Chinese, English, Russian, Spanish, Portuguese, French. 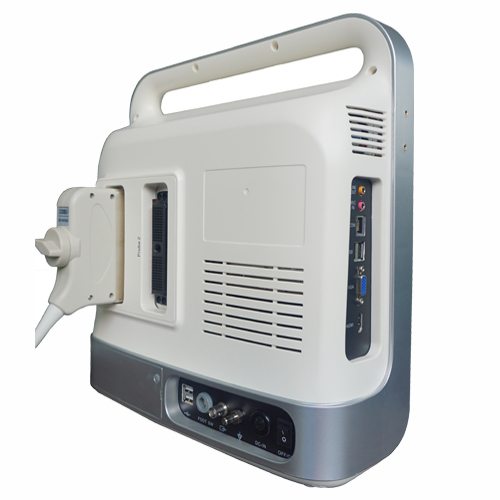 Ultra-sonographyHigh-precision digital continuous beamformer: The fine ultrasonic beam control effectively removes the side-lobe noise, greatly improves the spatial resolution and contrast resolution, and exquisitely displays the entire organizational structure. Dynamic Frequency Fusion Imaging Technology: Adaptive control of the near field to the far field of the launch, receiving frequency, strong penetration and high-resolution images are the perfect combination.High-precision delay point-by-point dynamic receiver focus: Point-by-point high-precision delayed focusing on the entire image, showing real, delicate organizational information.Ultra-ideband imaging technology: According to different characteristics of the crowd, you can choose the best center requency.Adaptive image optimization processing technology: Based on the currently received tissue signals,digital parameter optimization is automatically performed to present a more perfect ultrasound image.THI tissue harmonic imaging technology: Ultrasonic emission at a lower frequency, and receive the echo signal of the second harmonic signal imaging, to ensure good penetration at the same time, enhance tissue imaging resolution, and to maximize the elimination of artifacts.Precise SRI adaptive speckle noise suppression An adaptive speckle noise suppression algorithm based on precise image recognition not only smoothes peckle noise but also preserves the features of tissue structure. M Mode:Slope, ratio, stenosis rate, heart rate, time. Uterus, endometrium, ovary, cervix, follicle measurement. GS gestational sac, CRL head and hip diameter, LV spine length, BPD biparietal diameter, OFD Occipital bone frontal bone diameter, HC head circumference, TAD transverse abdominal diameter, LVW lateral ventricular posterior angle width, HW cerebral hemisphere width, TCD cerebellar lateral diameter , IOD intraocular diameter, OOD external eye distance, BD binocular distance, APTD DBH, TTD transverse DBH, AC abdominal circumference, APD antecedent abdominal diameter, FTA trunk cross-sectional area, HL humerus length, ULNA ulna length, RAD radial length, FL Length of femur, length of tibia, length of fibula of FIB, multiple calculation of APTDxTTD, length of clavicle of clavicle, dysplastic hip (measured hip angle), etc. 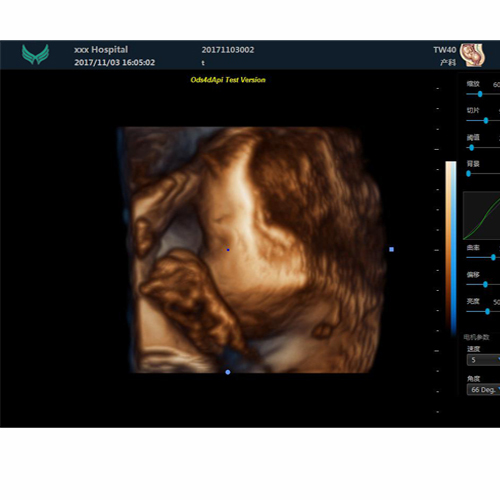 The gestational age, fetal weight and expected date of birth can be calculated. Prostate volume, bladder volume, residual urine volume, volume of prostate transitional area, hip angle measurement and assessment (neonatal hip dislocation diagnosis), cross-sectional measurement (V-Slice method). The main measurement and analysis of vascular cross-sectional area, heart rate, per volume, flow per unit time, ejection time, stenosis rate, average velocity of blood flow, RI resistance index, PI pulsatile index. ≥95 kinds of symbol position markers with probe position. Through the intuitive body mark detail interface quickly select the body mar. Text markup, presettable text content.